If you have bread left over's not necessary to worry. 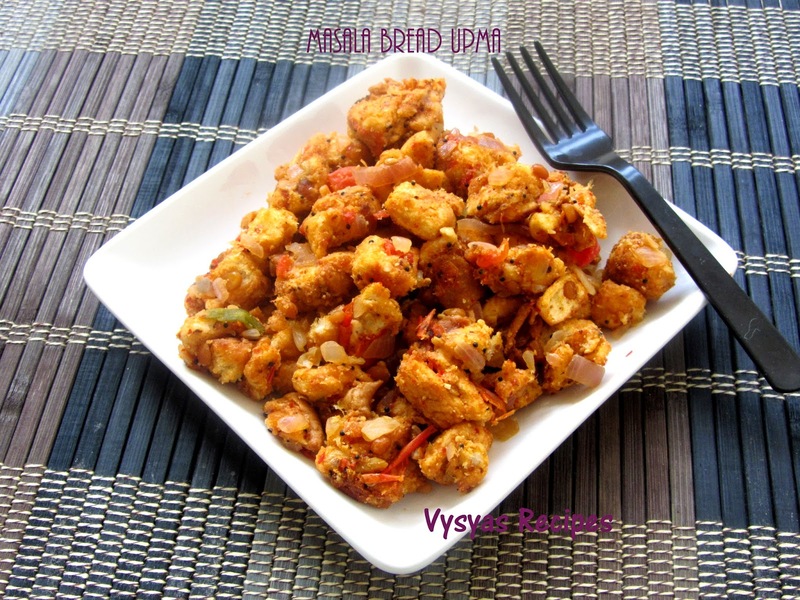 you could make delicious Masala bread upma with it. Masala bread upma is made with bread, ground spices,coconut and dalia(chutney dal). This is an authentic recipe, that we make at our homes. it is my favorite upma. you could also have it as a evening Tiffin. saute the breads in a tsp of Ghee till it turns golden brown here and there. Grind red chillies,coriander Powder ,salt,turmeric,roasted channa dal ,coconut together with needed water. Heat the oil add mustard seeds when it splutters add chana dal,urad dal,green chillies, curry leaves. when dal's turn's golden brown add onions. when onions turns pink, add tomatoes, saute till tomatoes turns mushy. Add Ground paste, with cleaned water in a blender. Saute for 5 - 7 minutes, till raw smell Goes, and comes in the form of gravy. Add the bread cubes, mix well till bread cubes, are coated well with masala.